Chives are hardy, drought tolerant perennials. The leaves are round and hollow, similar to onions, but smaller in diameter. 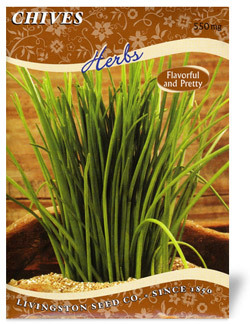 Excellent flavoring in salads, soups, stews, and sauteed dishes. Try growing some on a sunny kitchen windowsill! Matures in 80 days. Gardening Tip: The leaves can be snipped when plant reaches 6" tall. Leave about 2" for new growth.